Vajrasattva (Tib. Dorje Sempa), the ‘Indestructible or Vajra Being’, is an important bodhisattva and yidam deity whose meditation practice is employed in all schools of Tibetan Buddhism to purify the karmic defilements of body, speech and mind. His sadhana or visualization practice is particularly effective in overcoming the defilements of aversion and aggression; and a hundred thousand recitations of his hundred-syllable mantra are traditionally performed as one of the four ‘preliminary practices’ (Tib. Ngondro) of Vajrayana Buddhism. Vajrasattva is also recognized as the ‘Lord of the Sixth Buddha-Family’, the jnana or Wisdom-Family, who occupies the zenith, and as such he is closely identified with Vajradhara as the Adi-Buddha or the source of all mandalas. 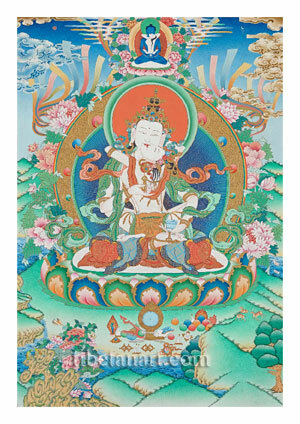 In the Tibetan Nyingma or ‘ancient tradition’ he appears at the centre of the mandala of the forty-two peaceful deities, as described in the Guhyagarba Tantra. Vajrasattva is also recognized as the lineage-holder who first transmitted the Dzogchen or Atiyoga teachings into the human realm, and here he often appears in a trinity consisting of: Samantabhadra (dharmakaya), Vajrasattva (sambhogakaya), and Prahevajra or Garab Dorje (nirmanakaya). Vajrasattva is represented here in sexual ‘father and mother’ (yab-yum) union with his white consort Vajragarvi (Tib. Dorje Nyema), the ‘Lady of vajra-pride’, who sits upon Vajrasattva’s lap with her legs wrapped around his waist as she presses every part of her body against his. She is adorned with the five silk and eight jeweled sambhogakaya ornaments of a goddess, and her long black hair flows freely down her back. With her two arms she embraces her lord, whilst holding a vajra-handled curved knife and a skull-cup of nectar behind his neck with her right and left hands. Vajrasattva is peaceful, youthful, and radiantly white in complexion like an autumn moon, with a sweetly smiling face, two eyes and two arms. He is endowed with the thirty-two major and eighty minor marks of an enlightened being, and he sits in vajra-posture upon a white moon disc and a multicoloured lotus. He is adorned with the five divine silk garments and eight jeweled ornaments of a sambhogakaya deity, and his black hair is bound up into two topknots, with loose strands hanging freely about his shoulders. With his right hand he holds a five-pointed golden vajra in front of his heart, and with his left hand resting upon his thigh he holds an upturned silver bell. A ring of rainbow light encircles his radiant blue inner aura and golden outer aura, with lotus flowers, leaves and rainbows appearing behind. Seated above his halo and the entwined clouds and rainbows of the upper sky are the blue Primordial Buddha Samantabhadra (Tib. Kuntuzangpo), meaning the ‘all-auspicious’, and his white consort, Samantabhadri (Kuntuzangmo). Their naked and unadorned dharmakaya aspects represent the union of pure appearance and emptiness, as they sit together in sexual union upon a moon disc and lotus. In front of Vajrasattva’s lotus-seat are jewel offerings, the five objects that delight the senses (mirror, lute, fruit, perfume and silk), and the seven insignia of the ‘universal monarch’ or chakravartin. Deer, fish and ducks appear amidst the water, rocks, flowers and foliage that adorn the beautiful lower landscape.